'New York, January 1896. Arthur Conan Doyle, the renowned creator of Sherlock Holmes, arrives with his wife Louisa at the Britannic Hotel in New York for his first American tour. While Arthur prepares for his lectures, Louisa becomes entranced by the vibrant, dangerous metropolis brimming with debauchery and iniquity around every corner. When a woman's mutilated corpse turns up in a Bowery alley, Louisa recognizes the victim as someone she's seen in the hotel. 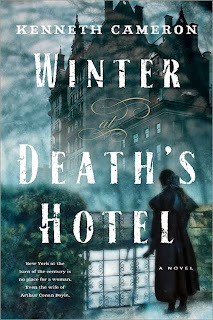 Obsessed with the woman's gruesome death, Louisa starts piecing together clues to reveal a story of murder and depravity--a story that leads back to the hotel itself and a madman who is watching her every move. You don't hear much about Louisa Doyle, Sir Arthur Conan Doyle's wife in history and the author's use of her as a main character was a fabulous idea and something that I found to be fresh. This book leaves me wanting learn more about Mrs. Doyle and what she was like in real life. I love books that leave me with the yearning to learn more and this was one that definitely made me more curious. It was a nice spin on a little know character and I enjoyed Louisa as the main character and sleuth in this novel that captivated me from page one. There were a few flaws with this one, but overall I found it to be a good read and I am curious to see if the author will write another novel featuring Louisa. Louisa is a strong character and the author makes her so interesting that I am actually in awe with what he has done with a historical personage that was so eclipsed by her husband's fame. In this one, Arthur Conan Doyle is present, but he takes a background seat and really lets Louisa's personality shine through. If you are looking for a book featuring the famous author, then you will be disappointed in this one. The flaws were that there were a little too sexual scenes for my taste. I prefer to have the hints without all the graphic detail and this one was a little over the top. This is just my personal preference, so while it bothered me some, it might not do the same for other readers. I really enjoyed the setting and the mystery in this one. It was thoroughly engaging and left me dying to finish it. The conclusion was a tad disappointing, but it does leave the door open for a sequel. I am hoping that the author will continue with this series as I think that he has made a fantastic character in Mrs. Doyle and I see a lot of potential there. I found this to be a somewhat entertaining and intriguing read, but there were some things that needed some work. I would pick up another book by this author and I am waiting to see if there will be another one featuring this fantastic character.